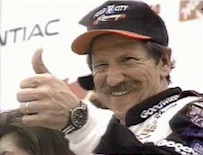 Dale Earnhardt, my hero, left us to soon. My heart still aches at the very thought or mention of his name and tears fill my eyes. He is a legend, just a few weeks ago a living legend. Now I would say he's giving God a race of eternity. I can see that sly grin underneath the famous moustache as he looks over at God in the car next to him and gives Him the thumbs up and it starts reigning threes. Since Dale died in turn 4 on the last lap of the Daytona 500 on February 18, 2001, everywhere you look there is the number 3. There's a 3 on the clock hanging on the wall, there's one on the watch you wear on your wrist. There's a 3 on every month of the calendar. Even before Dale Earnhardt was laid to rest there was a photo of a cloud taken over the DEI shop that appeared to have the likeness of the number 3. There are 3's on the front and back of t-shirts everywhere. There are 3 stickers in the back window of pickup trucks (mine included). There's a 3 on the cap that I wore while watching the Cracker Barrel 500 at Atlanta yesterday. There have been three races since Dale Earnhardt died. Since that time Fox has decided that the third lap of every race would be a silent one in the memory of Dale. Ironically, in all three races, the third lap has been run under caution. Is Dale letting his presence be known? During lap three at Atlanta almost all of the 120,000 fans at the track held at least one hand raised in the air with three fingers held high. There was even a huge No. 3 was painted in the Atlanta Motor Speedway infield, just past the finish line. Kevin Harvick, a rookie who answered the call of Richard Childress to take the ride in the GM Goodwrench Monte Carlo, served Dale Earnhardt and his fans proud by winning the Cracker Barrel 500 on Sunday. He said, "There was somebody in the passenger seat of the car making it go a lot better than I was. All I could think about there at the end was Dale telling me, 'You want that car to turn, just get into the gas a little harder.' "
Out of respect for Earnhardt, and in hopes of making Harvick's challenge of stepping into his ride a little less stressful, the team changed its Chevys from the famous black No. 3 to a white No. 29. Harvick finished 14th in that first race at Rockingham and then was eighth last weekend at Las Vegas. In between, he and his fianc�e, DeLana, were married. Harvick stated 5th in Sunday's race and stayed right about there all day until it came time to "get in the gas a little harder". In race No. 3 of his career he won in the same fashion that Earnhardt did here a year ago. The car was the same one Earnhardt drove at Atlanta last November where he finished second. Harvick won it by executing an Earnhardt-style three-wide pass and then holding off Jeff Gordon by 0.006 seconds, a closer margin even than Earnhardt's 0.10-second victory over Bobby Labonte in this event a year ago. "I remember sitting at home a year ago watching the man win this race," Harvick said after winning his first 500-mile start. "I felt somebody tapping me on the shoulder with about 10 laps to go and saying, "You'd better get going if you want to win this race." "The last five or six laps, I looked up to the sky and said, 'Dale, ol' buddy, help us out here a little bit,' and he did," said a tearful Childress, who lost his best employee and best friend at Daytona. After winning the Cracker Barrel 500, Harvick did a doughnut and burnout in front of the grandstand that would have even made Earnhardt smile. Then he did a reverse victory lap, which was started when Alan Kulwicki died, and from the drivers window held his arm high with 3 fingers raised. This ignited the fans and again all of them were on their feet, hands held high with three fingers raised. There are even more coincidences. Besides Kevin Harvick winning in his 3rd Winston Cup race. Last year he won 3 Busch series races and finished 3rd in the Busch Series points standing for the 2000 season. Kevin, also driving a RCR car in the Busch Grand National Series this year, is currently 3rd in the 2001 Busch series standings. Harvick was in the top ten in the running order for 303 laps in Sunday's race. He led a 1-2-3 finish for Chevys to the finish line. Although Harvick is 11th in driver points, his victory places the RCR Goodwrench team into 3rd place in the owners' standings. Matt McLaughlin of SpeedFx.com, writes a fitting ending to Harvicks win, For a grieving racing community there's not a lot better tonic than a race with an exciting finish, the kind of race that Dale would have understood. In this emotional time after such an emotional finish it's easy to lapse into quasi-spiritual interpretations that risk being trite, but I'll add my own to the mix. I remember the 1997 Daytona 500 when Dale Earnhardt rolled the 3 car. While in the ambulance he noted the car had come through the wreck in fairly decent shape, so he exited the ambulance and told the safety workers let me back in that thing. I'd guess seeing as strong as his old team is running, and watching a young man he predicted would be a star win today's race, Dale Earnhardt is up at that those Pearly Gates hollering at Saint Peter Let me back in that thing. "
My only regret is that Dale Jr. was not able to battle Harvick all the way to the end of the race. He had a car that could have won. He was one of the top-five battling for the win but a cut tire with just four laps to go caused him to have to pit for a new tire and he finished 15th. "The competitor in me is a little jealous," he said. "But I know how much my father meant to those guys, and it feels good to know they'll be able to go home tonight and celebrate." Dale Earnhardt Jr.s time will come. When it does it will even be sweeter and Ill be crying again. The legend lives and it's reigning threes.